9 PM Update: Corrected historical data from the National Weather Service shows that the March 1945 average was 56.2°, so the Washington record was actually broken by 0.6°. A gusty northwesterly breeze is bringing much more seasonable temperatures to Albany, New York as the month draws to a close, but March 2012 is going into the record books as the warmest in history by a wide margin. 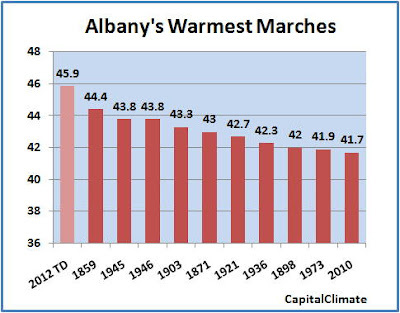 Official temperature records began in Albany in 1874, shortly after the formation of the U.S. Weather Bureau. Thanks to the Regents of the State University of New York and Dr. Philip Ten Eyck, however, monthly temperature records extend back to 1820. 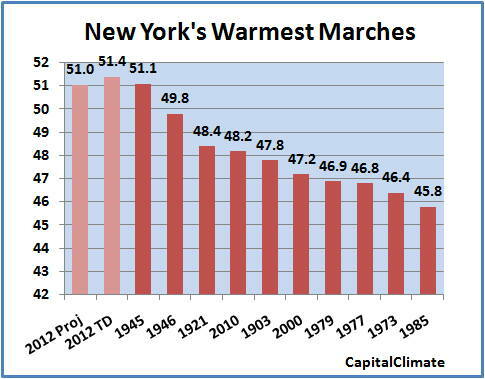 In the 192 years prior to 2012, there had been only one March with an average temperature over 44° (44.4° in 1859). With 2 days left in the month, the average through yesterday was an eye-popping 46.2°, nearly 2° above the old record and 11.6° above normal. Following temperatures forecast to range from the low 30s to mid and upper 40s through tomorrow, the final March average is likely to dip to around 45.8°, still 1.4° above the old record. 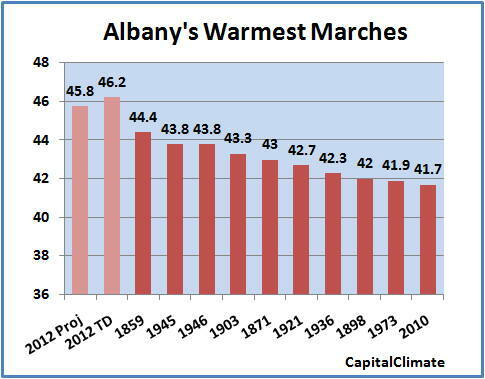 This would be the first time the March average has ever exceeded 45° at Albany. 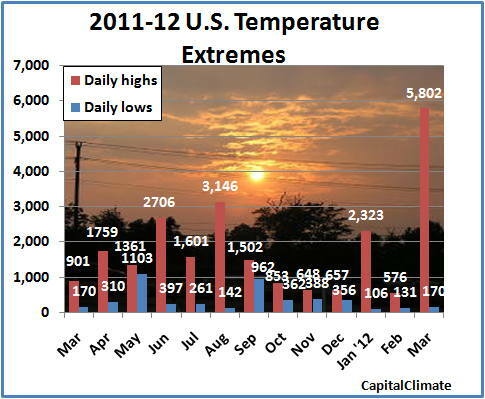 The 7 daily high temperature records now held by 2012 are nearly one quarter of the month's total and 5 more than the next highest years. Only one daily temperature record remains from as early as 1910. Following an afternoon high of 61°, temperatures at New York's Central Park are dropping below the morning lows this evening, but the March average through today is likely to remain at 51.4°. 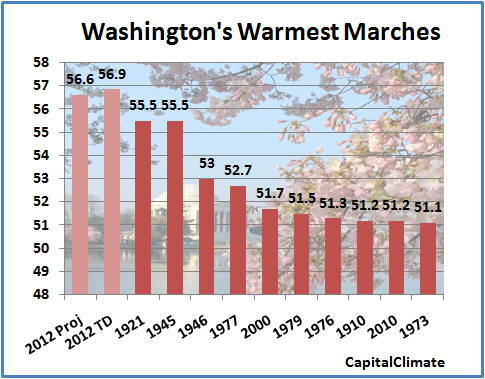 This is 0.3° above the record warmest March in 1945. With only two days left in the month, cooler temperatures into the weekend will lower the average, but it will still be within striking distance of the record. 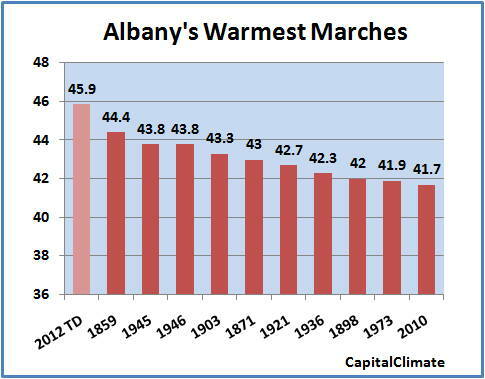 Along with the current 4th place March of just two years ago and the 6th place 2000, 3 out of the last 13 years will be in the top 10 warmest Marches in records dating back 143 years to 1869. 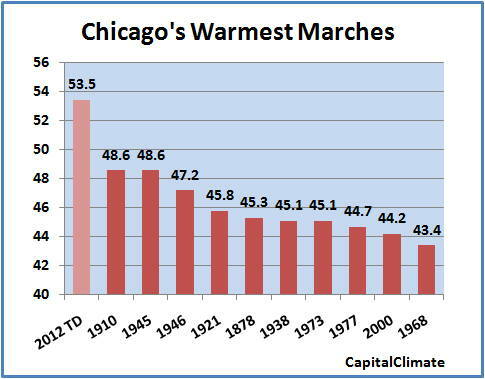 As previously noted, both Chicago and Minneapolis are crushing their records for the warmest March, originally set over a century ago in the remarkable year of 1910. These cities are both near the epicenter of the most extreme temperatures relative to normal this month, but the effects are significant at least as far away as Oklahoma. is the current record holder with a statewide average of 58.3 degrees. to challenge that record from just five years ago. 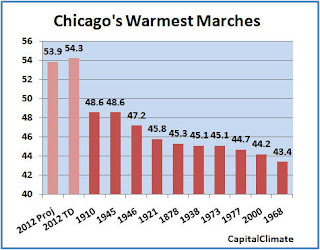 In the previous post, we noted that Chicago is well on its way to smashing the record for warmest March, despite the extreme temperatures which were observed in 1910. 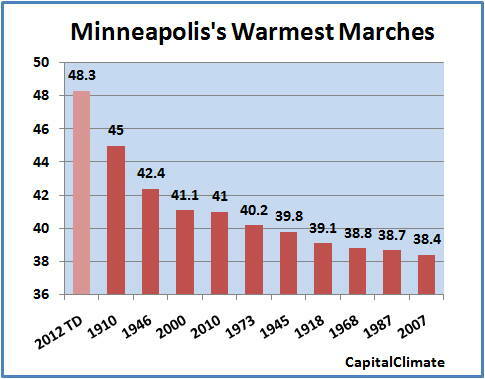 Now, let's look at Minneapolis, where the March 1910 heat was even more extreme relative to the long-term average (over 12° above). Through the preliminary high/low results for today of 53°/40° (9° above average), the monthly average temperature at Minneapolis stands at 48.5°. This is 3.5° above the previous record in 1910. Based on the current forecast of temperatures reaching as high as 71° on Saturday, the 31st, the projected average for the month is another 0.3° higher at 48.8°. 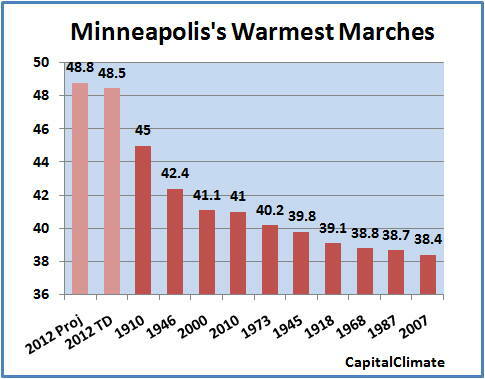 - As of March 28th, the maximum temperature in the Twin Cities has reached or exceeded 70 degrees on 8 days, breaking the all time March record of 5 days set in 1910. 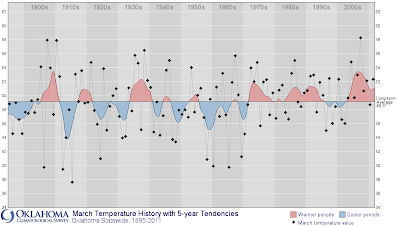 - The Twin Cities maximum temperature reached or exceeded 70 degrees for four consecutive days (March 16-19), breaking the previous record of three consecutive days which occurred on March 23-25, 1939 and March 22-24, 1945. - When the Twin Cities temperature reached 80 degrees on March 17, it was the first 80 degree temperature since October 9, 2011. The span without 80 degree temperatures was 159 days, the fewest consecutive number of days without 80 degrees in the modern record. 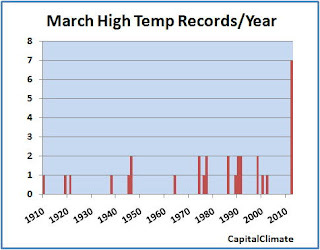 - March 23 2011 through March 22 2012 was the warmest 365 day period on record, back to 1871, with an average temperature of 50.5 degrees. - Temperatures in the Twin Cities stayed above the average high temperature for an incredible 13 days in a row, from March 13th through March 25th. - The high of 80 degrees on March 17th is the earliest 80 degree temperature on record for the Twin Cities. 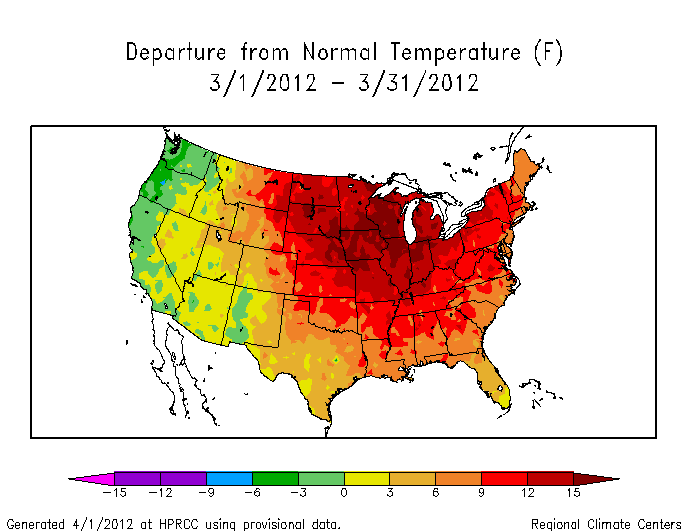 The previous record for the first 80+ degree temperature of the year was March 23rd, set in 1910. 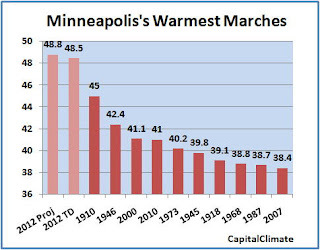 - The new maximum low temperature of 61 degrees, recorded on March 18th and 19th, is also the highest low temperature on record during the month of March in the Twin Cities. The previous record was 59 degrees set on March 17, 2012. The long standing record, prior to this year was 57 degrees set on March 27th and 29th 1910. The year 1910 had a very warm March, particularly in the north-central region of U.S. That makes it a perfect target for cherry-pickers to use to imply that the extraordinary record heat of 2012 is not that extreme. 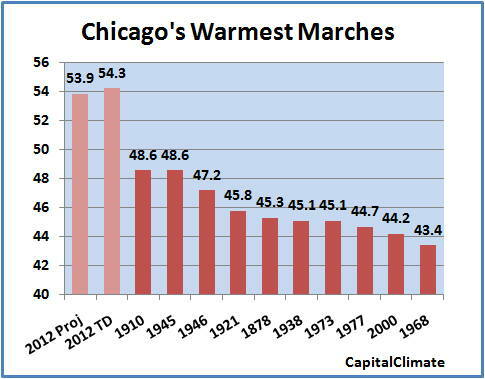 In Chicago, the March record high average temperature of 48.6° has held for over 100 years, although it was tied once in 1945. Through today, the month is averaging 54.3°, which is an incredible 5.7° above the previous record. 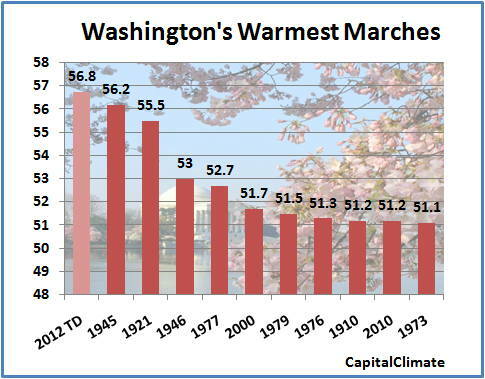 That's more than the margin between the previous warmest March and the 10th place month in 1968. 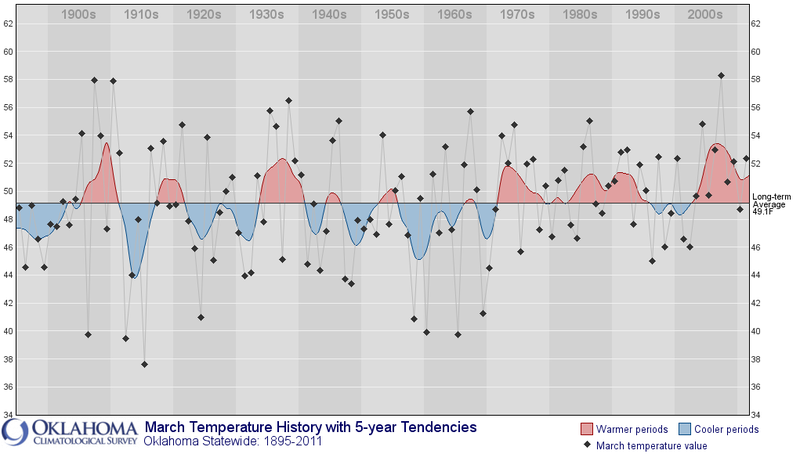 Even with the more seasonable temperatures forecast through the 31st, this March is likely to average around 53.9°, which is still over 5° above the old record. 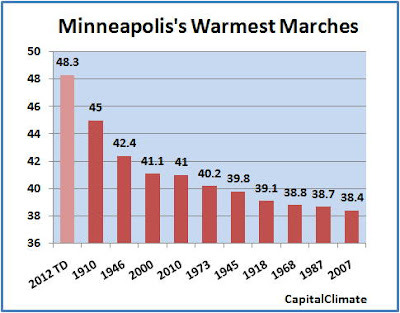 Stay tuned for an analysis of record warm temperatures at Minneapolis, where the 1910 average was even more extreme. March 28 Update: A new Scotland March high temperature record was set for the third consecutive day on Tuesday: 23.6°C at Aboyne. Fyvie Castle, in Aberdeenshire, recorded a temperature of 22.8C shortly after 15:30, edging past the previous high of 22.2C. This had been set in March 1957 at Gordon Castle, in Moray, and again at Strachan, in Kincardineshire, in 1965. The warmest ever UK March day stands at 25.6C, which was set at Mepal in Cambridgeshire in 1968. Temperatures continue to break records across parts of the UK. Cromdale in Moray reached 23.2 deg C on Monday breaking the record set the day before for the warmest March day in Scotland. March 28, 6 PM Update: Assuming that this morning's low temperature of 46° holds through midnight, the March average to date remains at 56.9°, but the projection has increased to 56.8°. 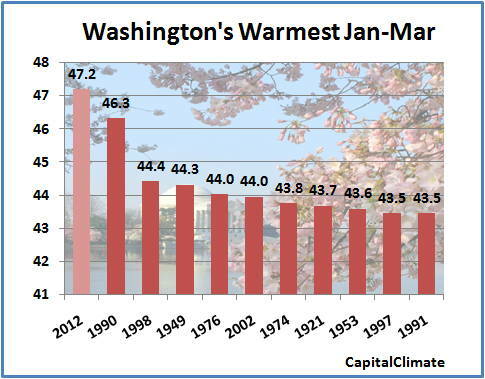 After a frosty morning low of 34°, Washington's high today of 55° was far below the record for the date of 86° in 1921. 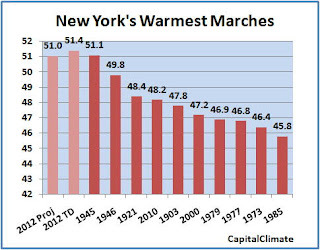 Nevertheless, the 1921 record for warmest March which has stood head and shoulders above all other years except for a tie in 1945 is about to be toppled by over 1°. 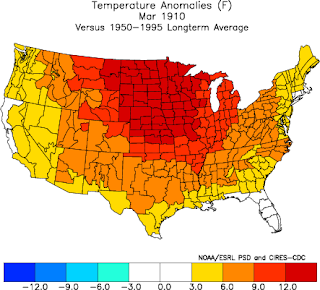 The first below-average day in over 2 weeks knocked almost half a degree off the monthly average to date, but the forecast temperatures through Saturday's end of the month indicate that this March will end up with an average of around 56.6°, which is still 1.1° warmer than the current record. 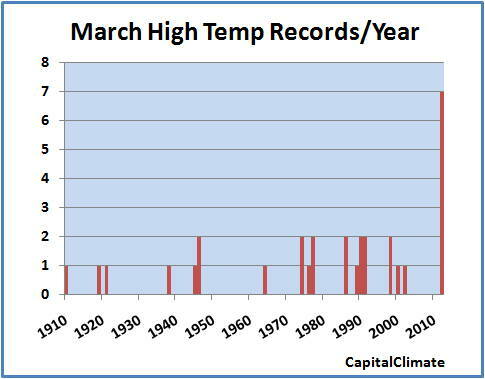 Exceeding a monthly average record by 1° is impressive enough, but doing it for a 3-month average is even more of an accomplishment. Although there's less than 1° separating the current second warmest first quarter (January-March 1998) from the 10th warmest (1991), the first quarter of 1990 was almost 2° warmer than in 1998, and the projected average for the first 3 months of this year is 0.9° above that. 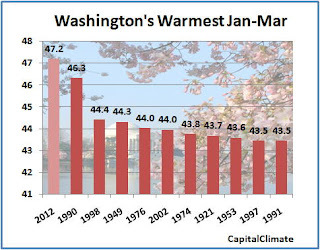 This record warmest first quarter for Washington follows the 3rd warmest winter and the 4th warmest year, including the hottest month ever recorded for the second year in row. The National Climatic Data Center temperature record reporting function has been down for maintenance for most of the past week, but it's back today with a continuing surge of new heat records. 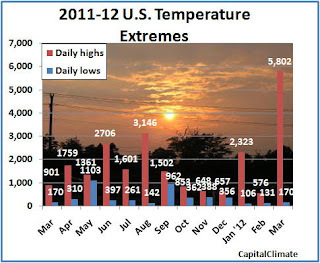 For March 2012 to date, an incredible number of 5802 new daily high temperature records have been reported in the U.S., vs. a mere 170 low temperature records, a ratio of over 34 to 1. The monthly total of heat records for 26 days so far is now higher than the cold records for the entire year of 2010. 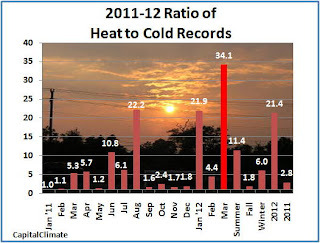 For the year 2012 to date, the heat records outnumber cold records by a ratio of 21.4 to 1. CapitalClimate charts from NOAA/NCDC data, background image © Kevin Ambrose (www.weatherbook.com). Includes historical daily observations archived in NCDC's Cooperative Summary of the Day data set and preliminary reports from Cooperative Observers and First Order National Weather Service stations. All stations have a Period of Record of at least 30 years.